One of the most amazing aspects of the lives that we live has always been the friends that we have made along the way. We have many fond memories of our shared experiences with our friends Ken and Nancy and their four children. 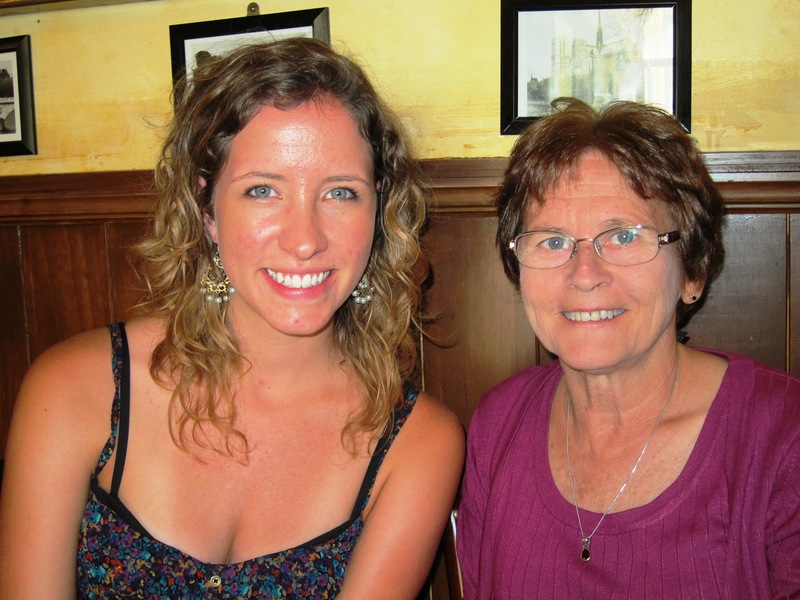 We arrived in Germany at the same time for one year of ministry at Black Forest Academy and shared many of the joys and struggles that are an inevitable part of the experience. Their oldest, Dan was a classmate of Dave with Steve for their Grade 8 teacher and Rachel was in Grade 6 with Liz. Rebekah was just seven years old and Anna a very delightful little four year old. At the end of the year they headed on back to their rice ranch in California and we back to Ontario. Their family visited with us the following summer and Liz and I had a wonderful visit in February of 1997 with them in California. Although we have not had a lot of contact since that time, they are people who very much share our love for family, missions and travel and we recently reconnected through their involvement in missions as Ken and Nancy also head into their “retirement” years. It was a real delight to hear that Rebekah and Anna would be travelling in this area and would like to visit for a few days. They arrived Thursday evening and had to fly out again Sunday morning so it was short but so much fun to have young people hanging out in our place for a few days. We spent one day touring outside the city to Batu Caves and took a drive up to Genting for a ride on the cable car over the rainforests. They even got to experience what it is like to drive in a Malaysian downpour. Rebekah is a nurse in Seattle and Anna an English teacher so we had lots to talk about and even watched Les Mis long in to the night trying desperately not to giggle at the subtitles. We pretty much have the city tour down to a science now and Saturday was a beautiful day for seeing the sights. 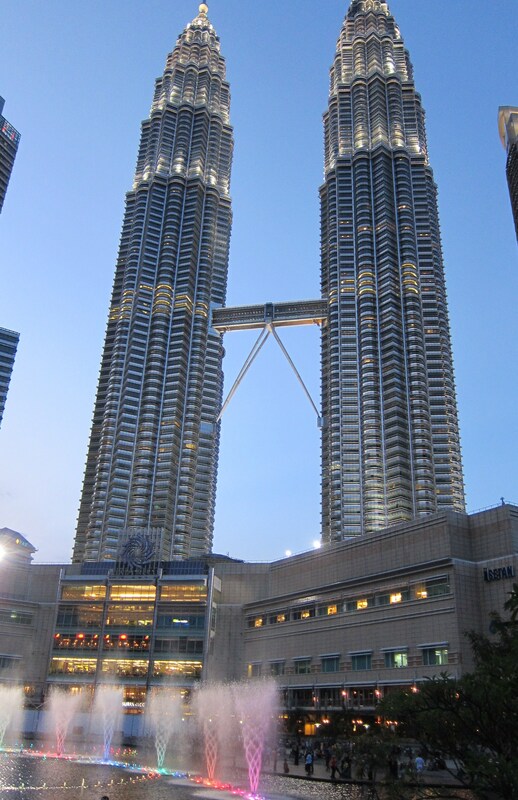 We were able to time it perfectly so that we covered Chinatown and Little India, the malls and the aquarium, found a Mexican restaurant for Anna (who has been living in China since August and was having some cravings), and arrived at sunset to sit in the park at KLCC and watch the lights and water show at the Towers. It is fun to see not only our own children but our neices and nephews and the children of our friends all grown up. What lovely young ladies these girls have become. It was great to catch up on all the family news but tI have to admit the place pretty empty with them gone. Musicals did not start in the year of my birth, although 1949 did begin the golden age with the edgy and amorous South Pacific touching on issues of racial romance and indoctrinated bigotry (“You’ve Got to be Carefully Taught”). But it was the soaring lyricism of “Some Enchanted Evening” and “Younger Than Springtime” that embedded this musical into my young psyche. Mom wore the grooves off the LP to such an extent that even now I could sing most of the score from memory. The same is true for the lighter, but no less racially edgy romance on view in The King and I, another musical with a songs that seem to cling to your memory like dear friends. Probably my favourite from those early days was Porgy and Bess, a musical that was originally staged in 1935 and again in 1942. But it wasn’t until the 1953 revival in London’s West End that all of Gershwin’s glorious music was performed. What a score that was! There isn’t a song in that musical that doesn’t grab you, from the sly suggestiveness of “It Ain’t Necessarily So” to the plaintive “Summertime.” But all of these early successes pale beside the enormous success of the last half of that decade. One year after the other there was My Fair Lady, West Side Story, Gigi, The Sound of Music and Oliver, each with at least half a dozen well crafted, powerful and memorable songs and lyrics. But with the start of the 60s came the start of rock and roll, and while jazz and swing were admirably suited to the stage, rock was far less so. There was still the occasional gem of a show: Fiddler on the Roof in the 60s; Chicago in the 70s; Phantom of the Opera in the 80s; Rent in the 90s; and Wicked in 2000. However, the musical has never returned to the force it was in the twelve years between 1949 and 1960. Which brings me to Les Mis, which we went to see last night. (The sweet little attendant wanted to know if we meant Less Miserable!). Pam loves musicals as much as I. 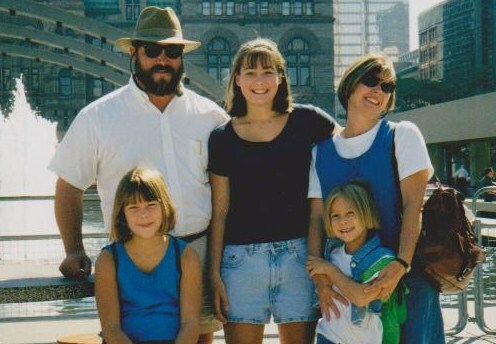 For years at Christmas we would sit around the telly with our children in our laps and sing along with The Sound of Music.We took our children to see Phantom in Toronto, enjoyed the film version of Chicago and loved the stage production of Wicked, which we were fortunate enough to catch in Singapore. We had heard nothing but rave reviews about this film, so we were both looking forward to seeing it last night. I am sorry to say it was a disappointment. There is nothing wrong with the story; it is a little convoluted, but that was the style in the days of Charles Dickens and his literary doppelganger across the Channel, Victor Hugo. Nothing wrong with the acting either. Russell Crowe was a little wooden, but then so was Javert, whose role he plays. It is nice to see that Hugh Jackman has some range beyond his Wolverine rage, and Anne Hathaway is transformational as Fantine. Once she dies – far too early in the treatment for my liking – the film loses half its radiance. But it is the music that disappoints. Oh yes, “I Dreamed a Dream” is a song as lovely as any from the ‘classic’ era, and “Master of the House” as catchy as “You’ve Got to Pick a Pocket or Two,” from which it obviously derives. “On My Own” is sweet as well, and nicely sung. Now name me another. Stuck? No wonder. There is really nothing else that you can even call a tune. Instead you have atonal ramblings: words set to notes, but not tunes. I can name you ten songs from West Side Story without breaking a sweat. And sing them for you as well. Why? Because songs are powerful instruments that stir the heart and mind for decades; because in a musical the score is everything. 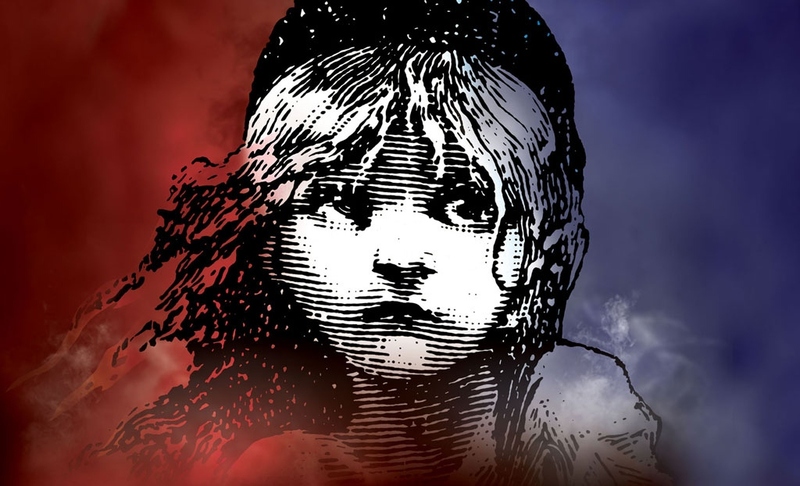 And aside from two or three songs, Les Mis was a musical looking for its music. If I had not grown up in the 50s and heard all these glorious showtunes played over and over again by my frustrated songstress and fangirl of a mother, I might have enjoyed the show. But I am cursed with an awful knowledge: I know what a good musical sounds like. And Les Mis, unfortunately, ain’t! Here are the just the songs I know and love from the musicals I mentioned. I bet you know a dozen or more of these yourself. At the end of the list I have provided a link to the reviewer at The New Yorker magazine who agrees with my assessment, but is far funnier than I in doing so! 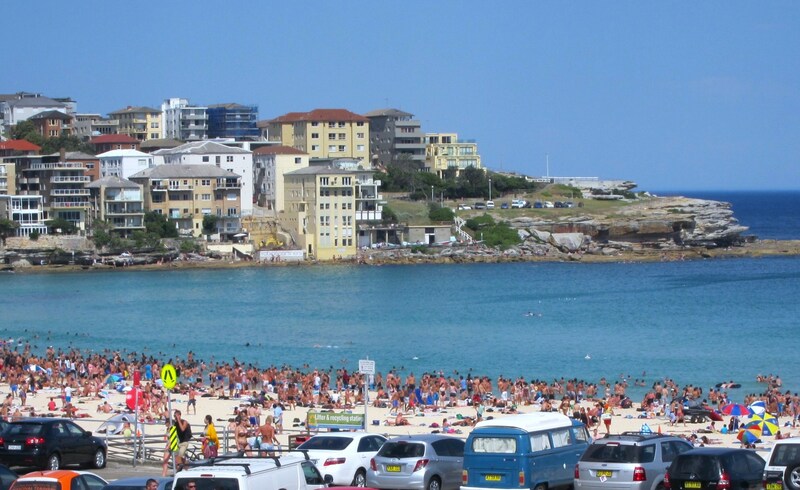 Bondi, Sydney’s claim to world beach fame, is a three dollar bus ride from the center of town. 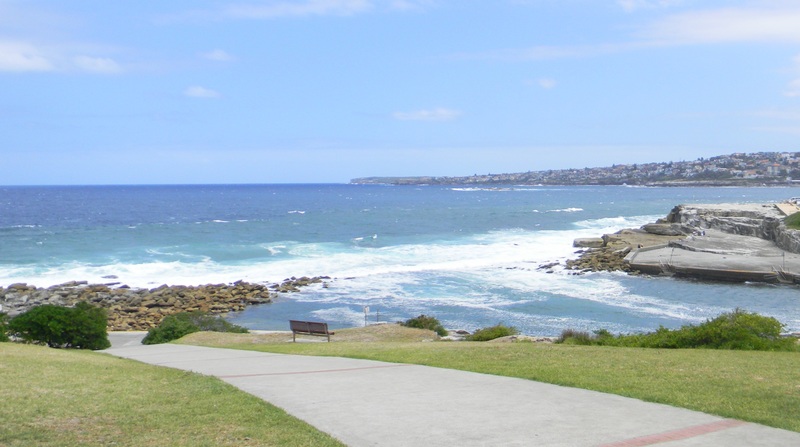 The walk from there to Coogee Beach is six kilometers of nature’s finest, laid out for geriatric codgers to negotiate. 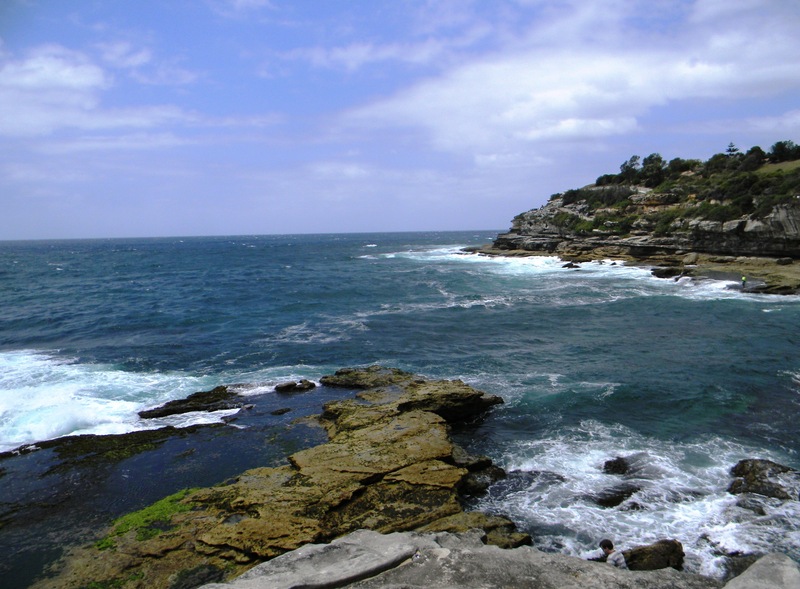 I didn’t make it all the way to Coogee, but I made it to Clovelly in moderate walking pace stopping often to take pictures of the views in about three hours. It was time well wasted. You can take the train to Bondi Junction, but then you would miss walking through Hyde Park in downtown Sydney; not as famous as its namesake in London, but just as nice and certainly no less Victorian with its obligatory statue of the Missus, and her Consort guarding the entrance, and fountains with heroic figures taming the sea serpents to be had along with the Aussie’s favourite explorer, Captain Cook, and a very touching Anzac memorial to the soldiers of Gallipoli and other conflicts. Don’t miss St. Mary’s Cathedral on the east side of the park. 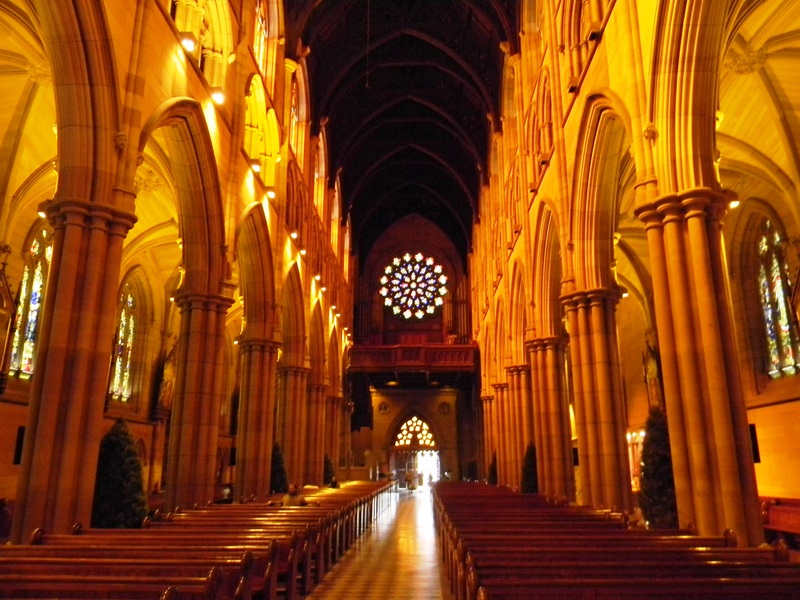 The outside is deceptively plain, but the inside is bathed in a golden light that illuminates the graceful arches of its nave and seems to breathe a reverence that is often missing from more popular cathedrals in Europe. The bus to Bondi starts at the appropriately named Victoria Street and the driver will be looking for exact fare so buy the bottle of water you are going to need at the beach and get some change. Buses in Sydney are clean and fast and I enjoyed the ride. The bus will go right down to the beach itself, but the nicer stop is the one at the top of the hill so you can take in the view. I went early on a cool day before the crowds and the heat built up. 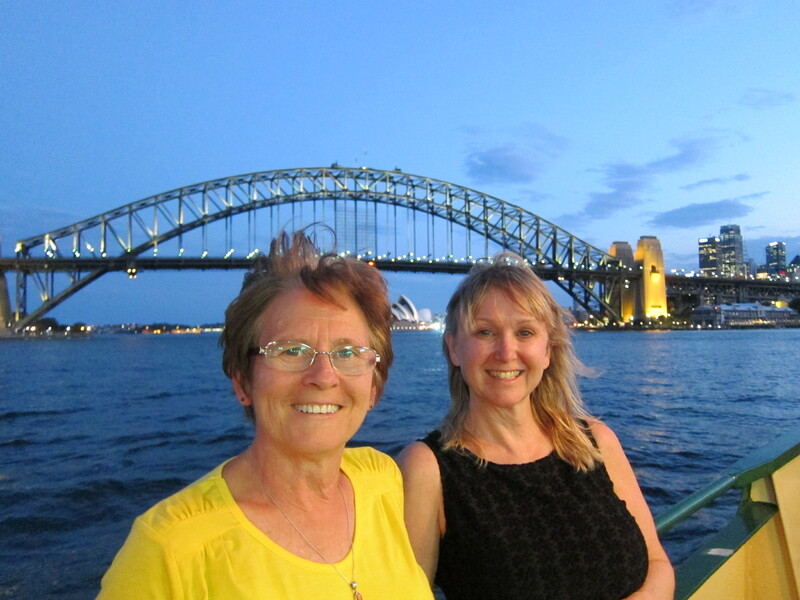 Pam and Shelley had gone a day earlier in the middle of a scorcher of a day – 43 degrees Celsius – and the beach and the water were wall to wall with people. I am glad I chose a cooler day for my walk! I only stayed ten minutes at Bondi itself, as the walk itself was my goal, but I did wade for a bit and the sand was a golden granular tan and the water clean and relatively warm. South of the beach at the beginning of the walk is the Polar Bear Swimming Club that has a pool overlooking the ocean. Beyond that the path starts to climb, but never gets too high above the water at any point and often comes right down to the beach. The views of the cliffs dropping off to the restless sea are ever changing, and each new bay has its own particular character. 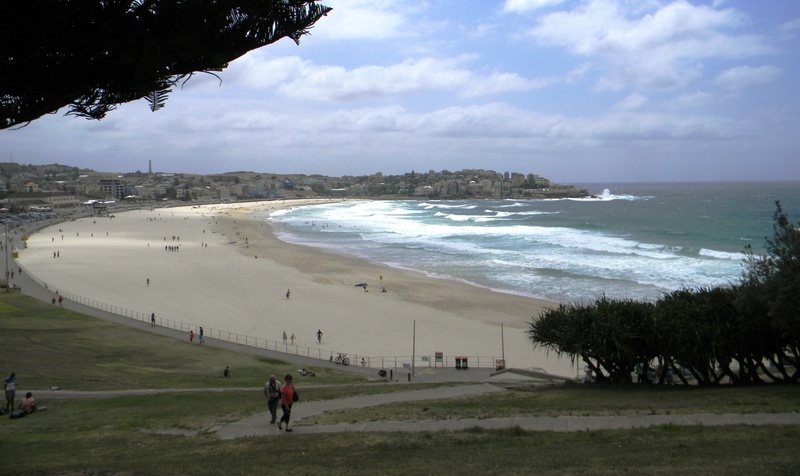 My favourite was Bronte Beach, named not for the writer, but for Lord Nelson, Duke of Bronte. Despite that literary disappointment, the beach was very nice. 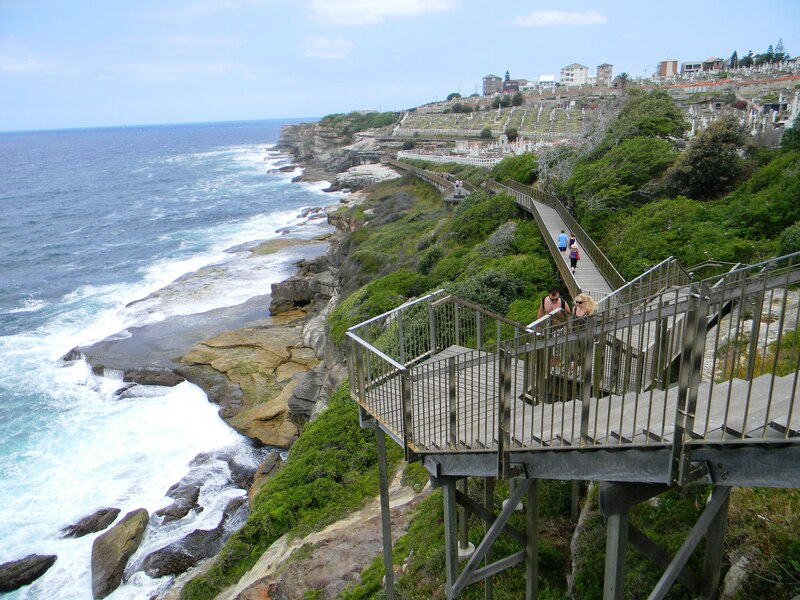 It is scorned by surfers as its narrowness and embankment of shale rocks make it unsuitable with better beaches at Bondi and Clovelly nearby. It is therefore free from the aggravating surfer dude culture that characterizes the larger beaches, making it not only safer for swimmers, but quieter, more relaxed and more civil. I had a very nice fried fish for lunch at a little spot overlooking the beach at a reasonable price without having to listen to a single misogynistic word before pushing on. At Clovelly the cliffscape levels out and there is a flat 1.2 kilometer stretch through beach and town around to where the walk starts to get interesting again. My feet decided by that point that they had had enough, and besides there was one of those clean and fast buses waiting to take me back to Bondi Junction. This time I did opt for the train as I wanted off at King’s Cross and our hotel so I could freshen up for the afternoon’s activities. Our time in Sydney is limited, but there were plenty of backpacker hostels all along the coast, and this is a spot that you could easily spend a week in, running into town for the evenings if you were so inclined. 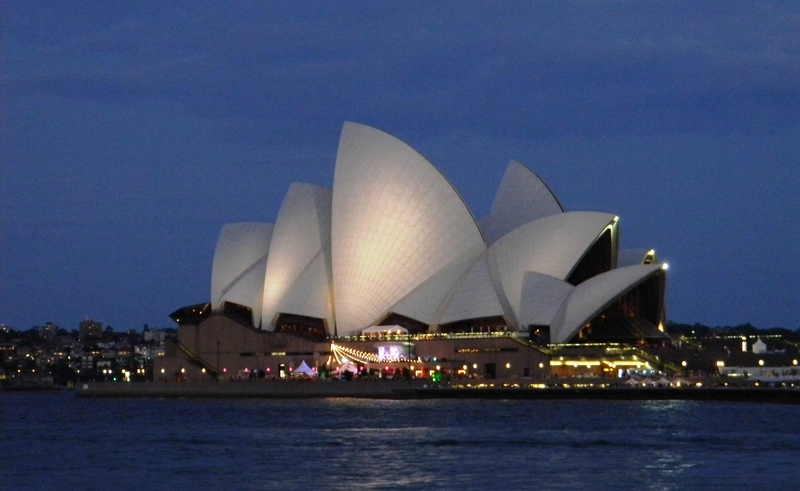 From KL you can get an eight hour flight with Air Asia to Sydney for around $500. As Pam noted in an earlier post, Sydney is a lovely city, and would be a joy to study, live and work there. But all around Sydney there are signs of Australia’s tenuous grip on civilization. The nation is a vast desert, as large as the Sahara, bordered by a thin coastal strip of habitable land that is barely a kilometer wide in some places. Global warming is a looming threat to a country constantly on the edge of drought. Recently entire subdivisions have had to be scrapped for lack of available water. On the two short days we were there 140 bush fires were raging in New South Wales alone. There were a hundred more in Victoria and Tasmania has suffered a devastating fire season with thousands stranded and hundreds of homes destroyed. The meteorological service had to add new colours to their maps to record temperatures well above the 50s in the interior. We flew north from Sydney and have rarely seen such a barren, arid wasteland. The heat builds up over this area and then pushes south. If the monsoon rains don’t come soon, it is going to be a long hot summer Down Under. Our itinerary for this trip called for us to transit through Sydney, Australia so it made sense for us to see the city on our way through. We arrived at noon on Tuesday and flew out Thursday morning so we needed to make the best possible use of the limited time we had. Our friend Shelley was also there so she and I bought tickets for the Hop On/Hop Off City Tour and headed out as soon as we had checked in to our hotel. The open topped, double decked bus provided some great views but the blazing midday sun and 43 degree temperatures quickly drove us back into the air-conditioned lower level. A stop at Bondi Beach sounded very inviting and it was indeed a very beautiful beach, but most of Sydney was there before us and it was pretty much standing room only. We did manage to find a quiet little restaurant for a salad and cool drink before we continued on our “guided” tour of the city. 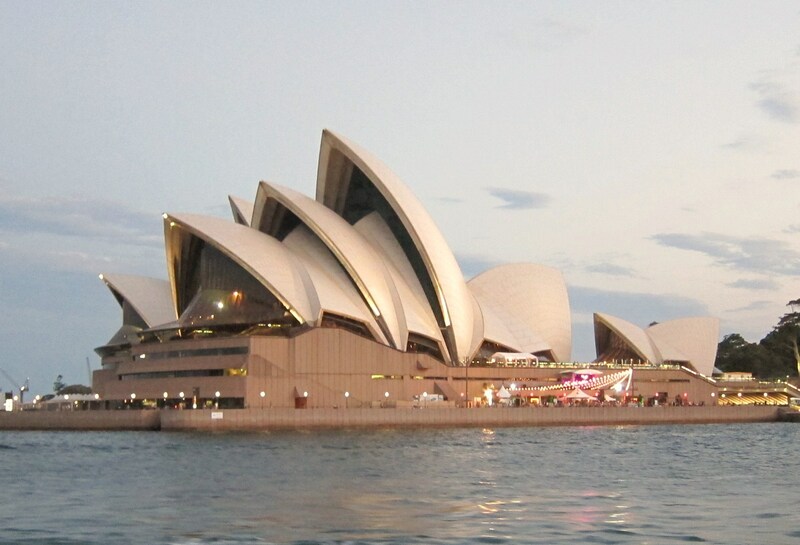 The Sydney Opera House is designed to represent a ship in full sail and is really quite a magnificent building, placed on a very prominent peninsula at the end of the Royal Botanical Gardens. 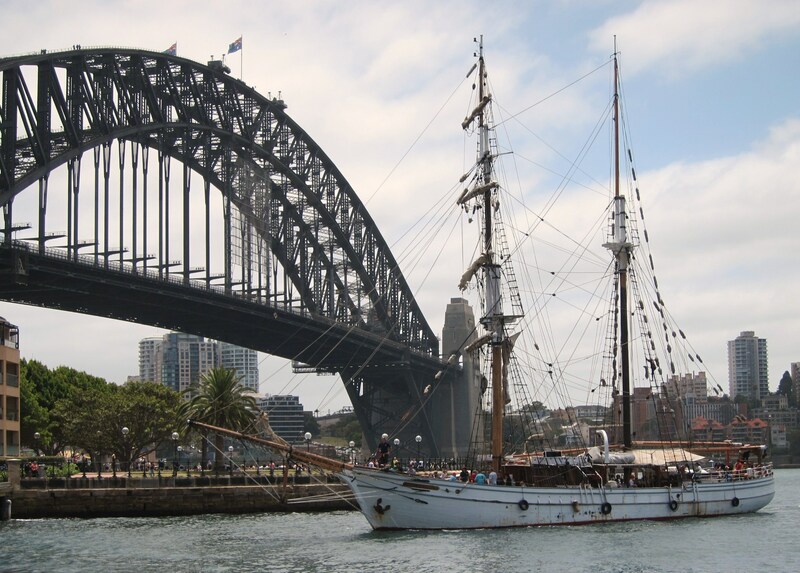 Across the harbour is the massive steel arched Harbour Bridge and beautiful sailboats and yachts glide continuously through the waterways. 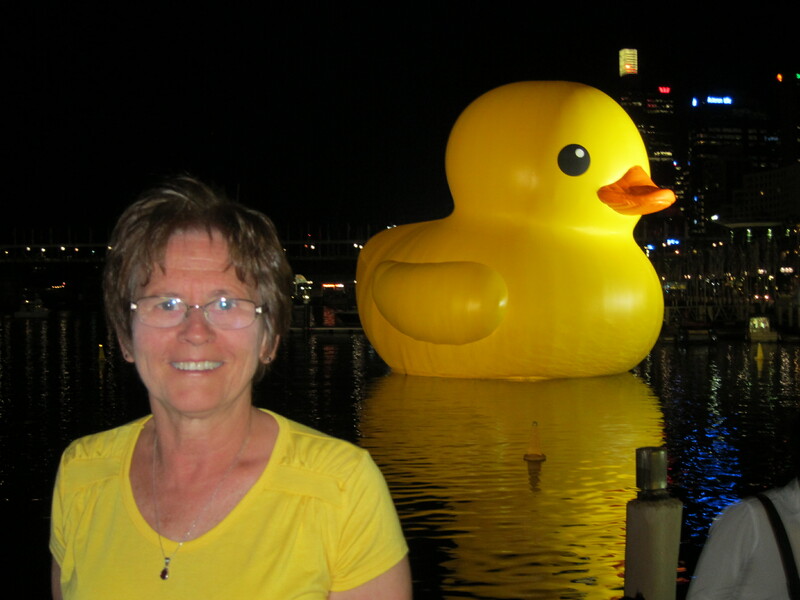 Unwilling to pay the exorbitant prices for a harbour tour, we opted for a $5.00 evening ferry ride from the Circular Quay to Darling Harbour where there was plenty of night life and a gigantic five storey Rubber Ducky, brought in for the Sydney Festival. 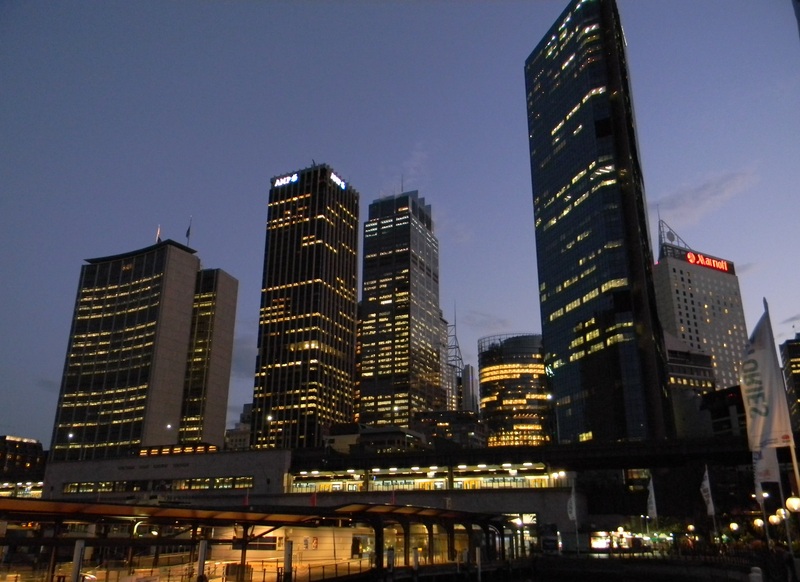 Sydney is really a lovely, lively city with a great mix of well preserved historical buildings and modern architecture. 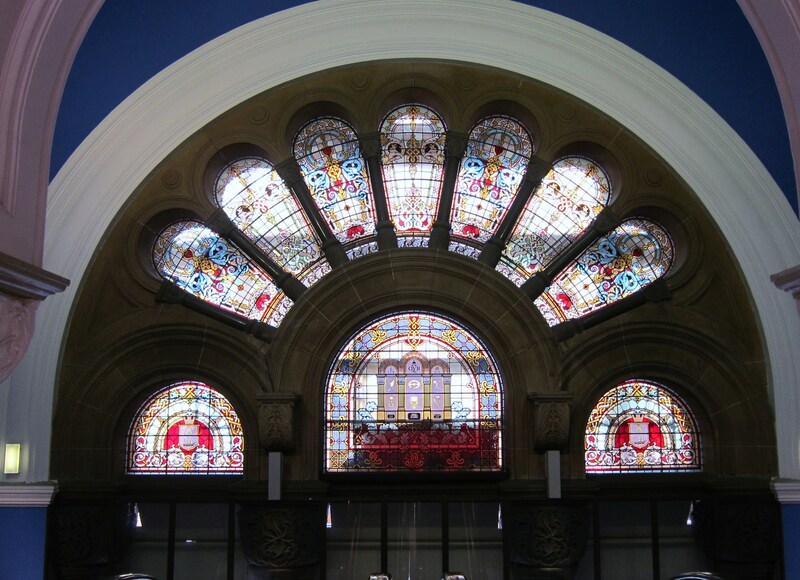 In the center of the business district you find the Queen Victoria Building. Originally built as market, it was scheduled for demolition in the 50s but fortunately was preserved and is now billed as the most beautiful shopping center in the world. While the building was modernized with the installation of escalators and air conditioning, its historical restoration is amazing. 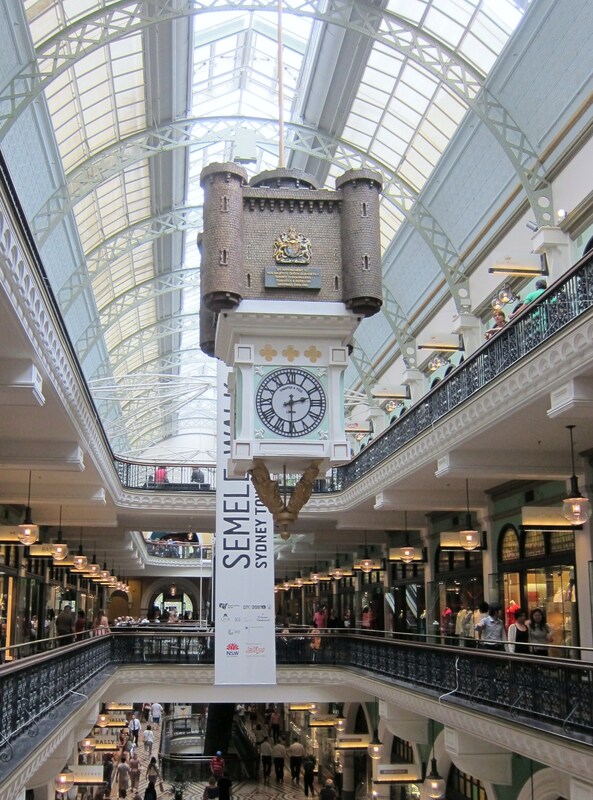 The tiled floors, stained glass windows, balustrades and arches are all carefully restored, creating a marvelous people place, not your average shopping mall. Sydney may be a beautiful city, but the temperature peaked at 43.4 degrees around 4 pm and we are just not used to that kind of heat in Malaysia. In Fahrenheit for our American friends that is 110 degrees. It felt very nice when the sun went down and even nicer to put the aircon on high for a few minutes back at the hotel. Tomorrow is supposed to be cooler, thank goodness! It seems like there are no straight roads in this part of the world, and the road from Queenstown to Dunedin was no exception. However, Pam had the good sense to book us into a small cabin at the campsite at the end of our drive that gave us a chance to drop our stuff and get into town for a bite to eat before sunset. The centre of Dunedin – the octagon – was a bowl surrounded by steep hills, scattered with fine examples of Scottish stonemasonry. We explored a few of the historic buildings before we settled into a little café for some blue cod and salad. In the morning we hit the road again for the long drive to Christchurch. Pam has a high school friend in New Zealand that she has kept in touch with over the years and she and her husband were kind enough to put us up for a couple of days. I even got in a chess game with their son Jack, who I barely beat at chess before he clobbered me in Go. On New Year’s we met up with Shelley, a colleague from the school where I teach who happened to be in New Zealand for the holidays as well. 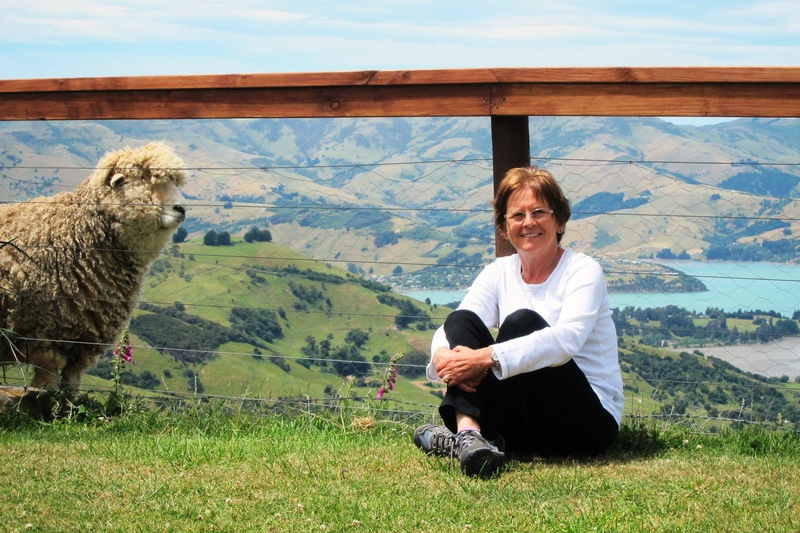 The following day we drove out to the end of the Banks Peninsula to have a look around. Again the drive and the views were dramatic and scenic. 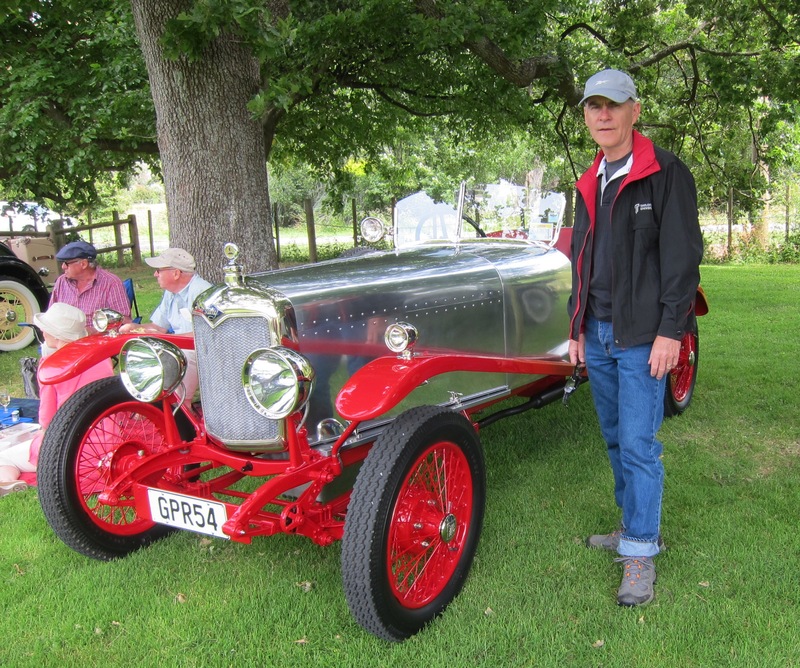 We had the good fortune to pass a classic car show on the way out and stopped to have a look at the old MGs and Austin Healeys. There were even a couple of three-wheeled Morgans, a rare car that Dad owned after the war. Pam’s friends gave us a lift to the airport in the morning, and we made the short hop to Auckland where we planned to spend a few days. We left most of our camping gear in the south, as it will be city touring from here on out and checked into a serviced apartment down by the quay. It is cheap and allows us to cook, which saves us money in a very expensive city. 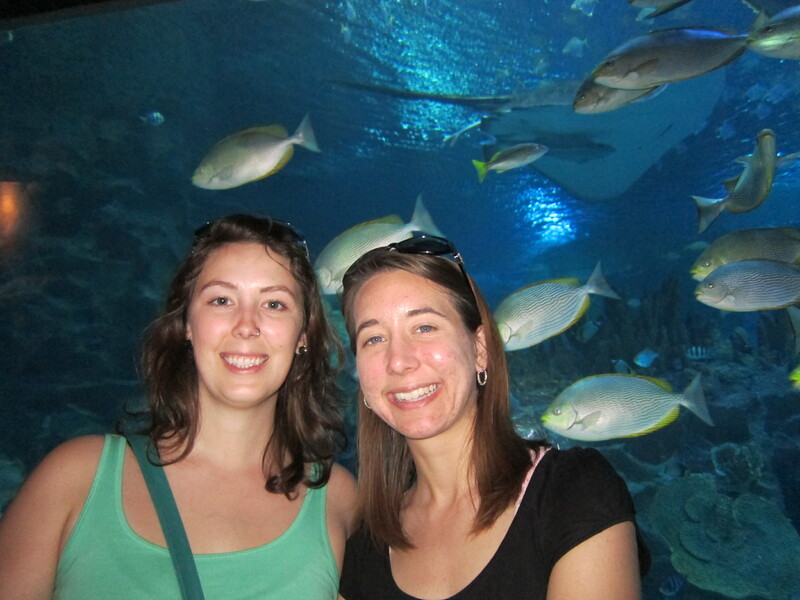 On our first day here we walked through some of the city’s many parks and checked out the Pacific Heritage Museum. 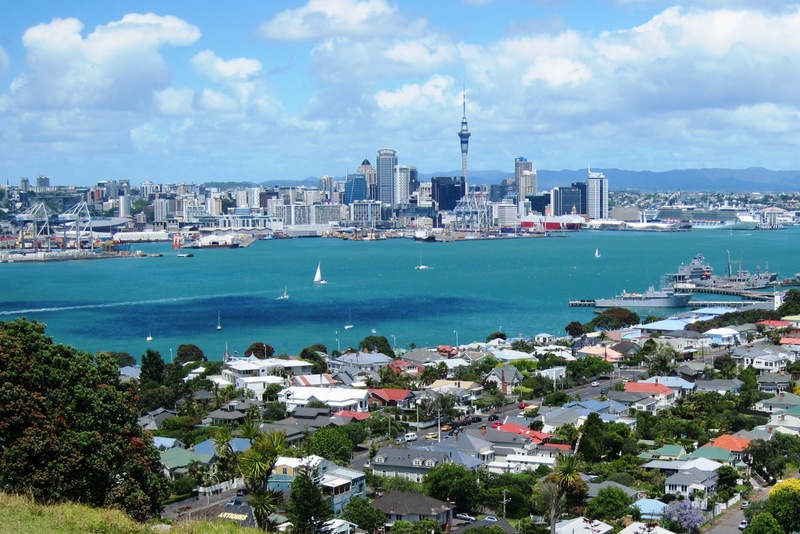 Yesterday we took a ferry out to Devonport for a view of the harbor and a walking tour of the old navy settlement. 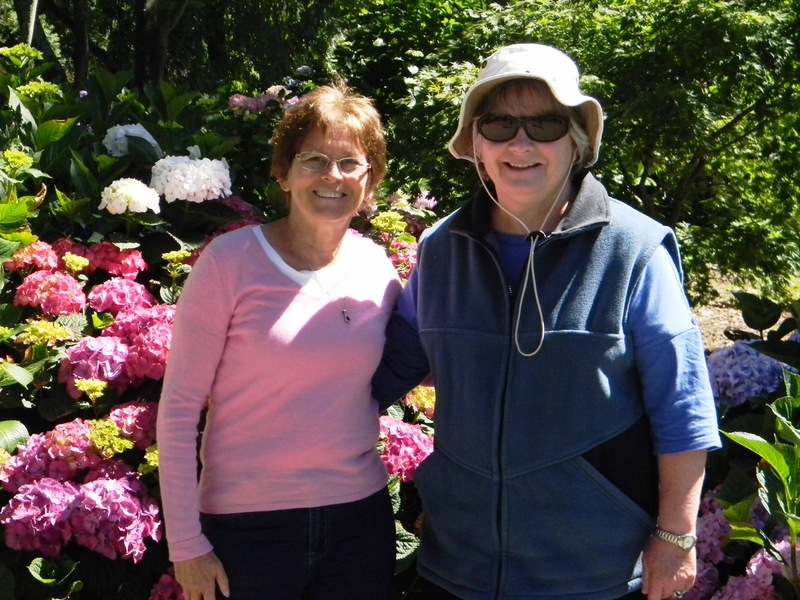 Today we got in a visit with Barbara-Anne, a cousin of Pam’s who is in Auckland on a working holiday. She knew a little place that did nice crepes for breakfast. It was nice to chat about family so far from home. While Pam did a little shopping for gifts for the grandkids, I got in another walk through Auckland’s fabulous parks and trees. Aside from a nice meal and visit with Shelley, New Year’s seemed to have just slipped by us. We hope you had a nice one, and that this year is filled with joy and adventure for you.